2013 Suzuki SX4 S-Cross prices and specs | What Car? The 2013 Suzuki SX4 S-Cross, will cost from 14,999 for a 1.6-litre petrol car in SZ3 trim with a manual gearbox. The SX4 S-Cross is available with either two- or four-wheel drive. The four-wheel-drive system includes four settings that let the driver change the car's electronics to suit different conditions. Two engines are available in the SX4 S-Cross a 1.6-litre petrol or a 1.6-litre diesel, which both produce 118bhp. The diesel unit gets a six-speed manual gearbox, while the petrol version can be specified with either a five-speed manual or an automatic CVT. Average economy ranges from 47.8mpg for the four-wheel-drive petrol with manual transmission, to 67.2mpg for the two-wheel-drive diesel. CO2 emissions for these models are 135g/km and 110g/km respectively. The SX4 S-Cross will be available in four trims: SZ3, SZ4, SZ-T and SZ5. Standard equipment includes seven airbags, alloy wheels, air-conditioning, cruise control, front and rear electric windows, heated door mirrors and a USB socket. Working up through the trims adds items such as larger alloy wheels, climate control, keyless entry, sat-nav and a reversing camera. A large sliding panoramic glass roof is also available on SZ5 trim. The best seller in the UK is expected to be the 1.6 diesel with two-wheel drive. It's available in all trims and is priced from 16,999. Company car users who want sat-nav will need to choose an SZ-T model, which costs 17,749 with the petrol engine and from 19,749 with the diesel. 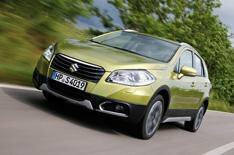 The Suzuki SX4 S-Cross will go on sale from October 1.